To foster the ongoing development of the FaithCentral site as an effective learning community, meeting religious education and special character needs of students and staff of Catholic Secondary Schools of Aotearoa New Zealand. FaithCentral will provide a single site portal to information and resources supporting the Understanding Faith program. FaithCentral will facilitate information and resource sharing while respecting copyright considerations. Material posted by FaithCentral will authentically reflect the beliefs and traditions of the Catholic faith, guided by the Bishops of New Zealand. FaithCentral will be an accessible, up to date and relevant site that meets the needs of its users, seeks feedback and responds to changing requirements. 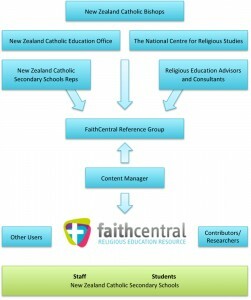 The New Zealand Catholic Education Office and the National Centre of Religious Studies are mandated by NZCBC to ensure an effective management structure is in place to implement the FaithCentral goal and produce a report annually. To assist in this NZCEO / NCRS have established the FaithCentral Reference Group. material reflects the teaching of the Catholic Church. a portal is provided to relevant, accurate and reliable resources to meet the special character needs of New Zealand Catholic Secondary Schools and can respond to their evolving needs. all legal obligations such as copyright, are met. up to date resources are sourced to support “Understanding Faith”. The FaithCentral Reference group will be responsible for establishing the conceptual framework, direction and policy of the website. A content manager will be appointed to handle the day to day business associated with the management of FaithCentral. If required, a theological auditor or review committee will be appointed to support the content manager. Other ad hoc appointments or committees will be established as required. If the content manager does not have the qualifications required to audit content, a theological auditor or review committee will be appointed as required. All material will be audited and approved before being placed on FaithCentral. Contentious material will be peer reviewed by a recognised expert. If there is doubt, the material is not to be uploaded. The appropriateness of the material on the site will be reviewed by client e-survey and feedback annually. The reference group will consider the feedback and recommendations for changes. The reference group will formally meet annually, to consider appropriate responses to any changes in the educational environment that will impact on the FaithCentral site. The content manager produces an e-newsletter twice yearly for secondary schools to maintain the FaithCentral profile and highlight any recent developments or improvements. The content manager will keep all contact information current. security and legal obligations are met. The website will be divided into a general access area and a secure (staff) password protected area. The general access area will primarily be an information portal. Sample assessments will be contained in a restricted access area. All material submitted will have the author’s permission – this also includes student work or exemplars. A standard submission form will be used to gain permission and meet copyright requirements. High security material will be protected by a password system. up to date resources are sourced to support Understanding Faith. Each month at least one item will be sourced or commissioned and added to the site by the content manager as a focus or view point article. The content manager will establish a network of potential contributors and actively follow up with requests for material that can be shared. This list should include DRS, HoDs and advisory staff. The content manager will oversee all updates of the site. The content manager will review the site regularly to correct or remove broken links. The site will use a content management system so that a defined structure is followed. There will be regular backup procedures. The content manager will ensure data integrity and security. Annual client annual survey and review of direction. Support content manager as time and skills allow. Formation of ad hoc Expert Committees as required. The Intention of the FaithCentral site is to facilitate the sharing of resources between members of the learning community. 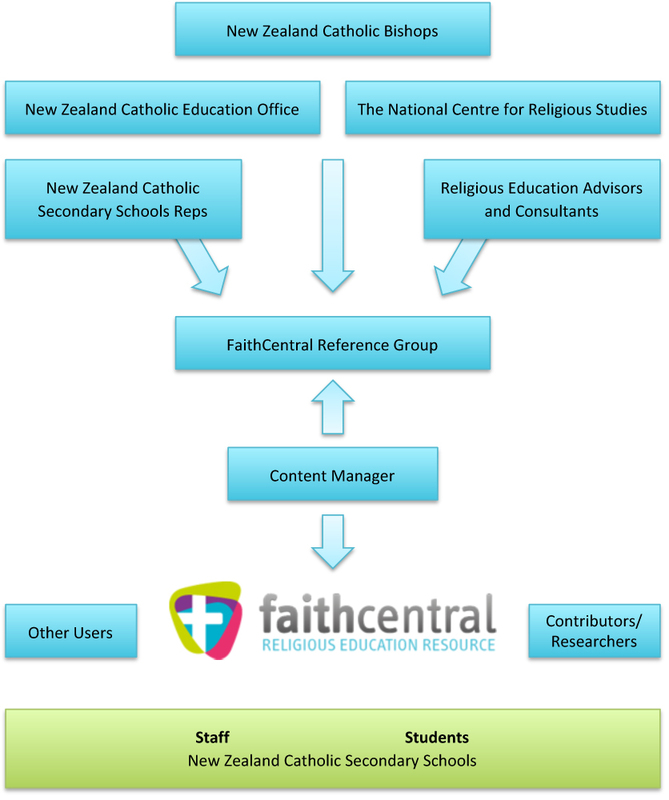 The FaithCentral sites (hereafter known as the ‘site’) are owned by the NZCBC and administered by the New Zealand Catholic Education Office and the National Centre of Religious Studies. This site and its contents including, without limitation, all articles, text, images, logos, multimedia, programs, design, documents, on-line graphics, and video are subject to copyright laws of New Zealand. Copyright protects the original skill and effort of an author of copyright works from unauthorised replication of that work. All content on this FaithCentral website is protected by copyright. Other than for private, congregational and educational use, do not reproduce materials without permission. Do not post content from this site on your own website without permission. These materials may not be copied or redistributed for commercial purposes or for compensation of any kind without prior written permission from FaithCentral or its contributors. Some material on this site is submitted by independent contributors. Material provided by independent contributors may include articles, comments, photographs, diagrams, pictures, sounds, video, and software. As a contributor of materials to this website, you retain copyright of your work. By submitting for posting material on the FaithCentral site, you allow us to reproduce, publish, modify and distribute any part of that material, or incorporate it in other works in any form. If you do not own the material you must get the owner’s consent before you post or upload it. This site has been compiled from information obtained from sources within the New Zealand Catholic Education Office, the National Centre of Religious Studies and the wider Catholic Secondary School Community and is subject to change without notice. FaithCentral has used its best endeavours to ensure that the information is correct and current at the time of publication. With respect to documents available from this server, FaithCentral and its contributors do not warrant or assume any legal liability or responsibility for the accuracy, completeness, or usefulness of any information disclosed. Notwithstanding any rule of law or equity to the contrary the New Zealand Catholic Education Office, the National Centre of Religious Studies, contributing Catholic Secondary Schools or their employees, agents, or consultants shall in any circumstances whatsoever be liable for any loss or damage (including indirect, special, or consequential loss or damage) arising from the use of, or reliance on the information, whether or not caused by any negligent act or omission. The New Zealand Catholic Education Office and the National Centre of Religious Studies makes available to you the provision to download particular documents, on the conditions set out below. If you do not agree with these conditions, then you should not download the material. You acknowledge and agree that FaithCentral will not be under any liability to you for any loss or damage including consequential loss or damage however caused, whether by negligence or otherwise, that arises in any way from the use of the downloaded material. You will not re-publish, or re-distribute the downloaded material to any other party without permission. This website is controlled by the New Zealand Catholic Education Office and the National Centre of Religious Studies from its offices at Hill Street, Wellington, New Zealand. By accessing this site, you accept that any disputes about this website or its contents are to be determined by the courts having jurisdiction in New Zealand in accordance with the laws in force in New Zealand. This website may be accessed throughout New Zealand and overseas. The New Zealand Catholic Education Office and the National Centre of Religious Studies makes no representation that the content of this website complies with the laws (including the intellectual property laws) of any country outside New Zealand. If you access this site from outside New Zealand you do so on your own responsibility and are responsible for ensuring compliance with all laws in the place where you are located. Email sent to FaithCentral may be seen by a number of people who are responsible for dealing with enquires. If the information specialist who answers the mail is unable to deal with your enquiry, the query may be forwarded to another New Zealand Catholic Education Office or National Centre of Religious Studies employee or contractor who is able to help. FaithCentral cannot guarantee the information transfer is secure. Any personal information that is sent to FaithCentral, for example, mailing address or details contained within requests, will be used solely for the purpose of responding to the request for information.